Running up a Business from grudges and falls is not at all an easy task to do. Situation becomes much more hectic if its just the starting stage for your Business profile. Managing schedules, reports, tasks to perform makes it impossible for an Individual administrative to handle all at once. Mobile phones have really emerged as a life saviour and that is what making them so much useful. You can find Mobile applications for any kind of tasks that earlier took the life out of us. If used in a right way these Business Apps can increase the productivity level up to much extent. They are no more the devices to dial and answer calls but can be your virtual assistant as well. While managing the in and out of a business there are lots of documents to be handled. It can be your reports, bills, research papers and other stuff too. There can be a chance of losing these important and required documents. CamScanner is the app that comes into action here. CamScanner is a handy document scanner app which you can use to scan the important documents and keep them in a safer way. It allows you to share the files just after scanning them or you can just keep them saved for later reference. The benefit with scanned files is that they are easy to print rather than captured pictures. You can create groups of documents related to a simple task and this way they will not be mixing with other stuff. You might have faced situations when you can’t actually find the right business card. As a business owners you connect with new people more often and exchange your business cards with them. Keeping numbers of business cards and then actually traversing among them is not at all productive. CamCard allows you to keep the business cards in a scanned form easily. You can then search among the saved cards and read the information whenever required. It also allows you to exchange eCards with the people nearby if they too have the app installed. This reduces you stress to keep the cards collected and managed. Each and every file is important while you are working for some projects. Even if a single file goes missing then it can create a lot of trouble for you as the representative. Google drive is one of the best Business apps that lets you store your files and folders on a cloud storage so that they can be accessed from anywhere and anytime. You don’t need to worry about the safety of your data as the storage is highly secured. A Google drive account is directly linked with your Google account and it provides 15 GB of storage for free. The storage can be exceeded by paying the charges as per your Business needs. If you are working in a group project then you can create folder with shared access. Choose to allow the people that can access that folder and file. This way all your work will be easily synchronized. Managing money is one of the major task that comes towards the Business manager. If the funds will not be managed properly then it can take the business right from top to the bottom in a slight drop. Walnut Money Manager is an AI based SMS tracker and Fraud protection application. The app keeps tracks on your expenses right from the transaction messages and notifies you about your expenses if you have set up a limit. The application also lets you keep an open eye on your Dues, Bills, Expenditure, Received amount and creates a clear report for your overall transactions. This will really help you in managing the spends in an effective manner so that you don’t actually waste a single penny. Todoist is a To Do List and Task Management application which lets you keep a track on your every work. Starting from the basic tasks like meetings, file submission to the advanced project handling tasks. Its far better than the ordinary to do list that comes pre-installed in the mobile phone. The data can be synchronized over all your devices so that you can focus more on your work. It also works offline and notifies you about your scheduled task. Buffer – Its a Social Media Management application to keep them updated all together. Microsoft Outlook: This app from Microsoft helps you in keeping all your Mails, Calendars and Contacts Managed. Basecamp: Application for managing Group tasks easily and efficiently. LastPass: To manage all your Logins and Passwords and keep them in safe place. Tide: Time Management app for increasing focus on work by splitting time in gradual breaks. Pocket: Helps you to save articles and then read them later in an interactive way. 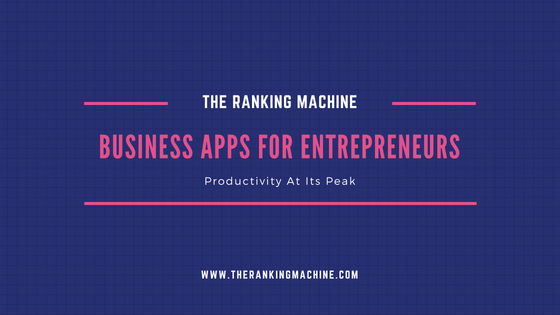 These were some of the basic and very popular Business apps for Entrepreneurs. There are thousands of productivity applications on the Google Playstore and they can’t be reviewed here at once. I have only listed the basic and much useful of them. Previous ArticleWhy Every Business Website Needs a Blog?